Mehmet (Kenan Imirzalioglu) is a poor guy who is desperately in love with Nermin (Selin Demiratar), from his neighborhood. He works as a welder in a shipyard while Nermin is a manicurist in one of the well known coiffeurs. Their only aim is to get married and have a nice home. Thus, they try to get rid of poverty by working harder each day. But, no matter how hard they try, they just never earn enough money to realize their dream of getting married and having a nice home. When Nermin gets in a term losing the hope of happiness, she comes across one of the playboys of Istanbul, Ender (Oguz Galeli). She starts to get closer to the glamorous life of Ender and edges away from the love of her life; Mehmet. She leaves her old poor life and her only real love behind and starts a new life in richness with Ender. Halil (Berdan Mardini) is an intrepid and righteous young man. He works as a porter at the port and has an honest life. One day, his blind father has become indebted for a large sum and wants to give Halil’s sister to the lender as payment. In order to save his sister’s life, Halil gets involved in the smuggling business. During that time, he meets Gulsum (Gercek Buyuk Saglar) who is a young woman and works as a belly dancer. They fall in love with each other but their love is affected by newly assigned district governor. This idealist patriotic young man, Cemal (Bulent Inal), is also struck by the beauty of Gulsum. Now, Gulsum is caught between the love and struggle of these two powerful men. Celebi family is a wellknown and respected family in Bursa (the city in western Turkey). The eldest son, Galip (Yavuz Bingol) runs the family business which is based on textile. Galip is married to Hanzade (Basak Koklukaya) and has a son named Omerasaf. Hanzade is a lovely young woman who has a secret that she cannot tell even Galip about. This secret has haunted her for most of her life and is a heavy burden on her shoulders. Although Hanzade has concealed the secret about her family for ten years, out of pure coincidence, Galip discovers this secret. An unforgettable tragedy transforms Galip’s life so radically that he will never be able to go back to the way he used to live and his whole life will change. Sila (Cansu Dere) is born in the Southeastern city of Turkey, Mardin. When her father, Celil (Menderes Samancilar), could no longer afford to keep his daughter, he gives her away to a rich family in İstanbul. Sila grows up in a much higher and wealthier status than her real parents. One day, her real brother Azad (Cemal Toktas) falls in love with the sister of agha and kidnaps her. The village is very strict to their customs, which includes to either kill the runaways, kill the parents of the runaways, or to have the agha marry the runaway’s sister. In this case, it is decided that long-forgotten sister Sila will be married to agha, Boran (Mehmet Akif Alakurt). In order to save her brother’s life, Sila accepts to get married Boran whom she doesn’t know. Asli (Pelin Karahan), Deniz (Ibrahim Kendirci) and Efe (Daghan Kulegec) are close friends and go to the same high school. Asli is an idealistic and forceful girl who wants to go to the university after high school although her family faces with some financial difficulties. She tries to be strong all the time but deep inside she loves Deniz and wants to be loved. Deniz has a wealthy life and likes to be a film director. On the other hand, Efe has a relax personality and doesn’t care about anything. Even though they have different characters, they live happily in a small town but soon the arrival of a new girl, Mine (Asli Enver), changes everything forever. Feraye (Berguzar Korel) doesn’t believe in beautiful days, people, and miracles. Her ultimate aim in this life is to find her son who was taken away from her by force 8 years ago. Although she works as a singer in a night club, she manages to maintain her innocence. She is a beautiful, young and decent girl in her difficult and dark world. One day, in order to save her workplace, she reluctantly accepts an invitation to dinner on a luxury yacht with a powerful businessman. However, dinner doesn’t go on according to plan and Feraye has to jump into the sea. On the verge of death, she is saved by a young man, Yaman (Bulent Inal). This accident which is the beginning of the hope for a greater love changes both the life of Feraye and Yaman. Omer (Ismail Filiz) works as a motor mechanic and has a comfortable lower middle-class life. He totally trusts his best friends, Ali (Baris Falay) and Cengiz (Yigit Ozsener). When he meets Eysan (Cansu Dere), he falls in love with her. After returning from military duty, he proposes to Eysan. However, the day after he proposes to Eysan, he is blamed for robbery and murder, while his friends Ali, Cengiz and his love Eysan gets away with millions of dollars ungratefully. Betrayed by his trusted friends and the woman he loves, Omer ends up in jail where he meets Ramiz (Tuncel Kurtiz) who will change his life forever. Ramiz is a powerful mafia type figure who sees Omer like one of his sons, and gives him some protection. After 8 years in prison, with the help of Ramiz, Omer escapes the jail by using a riot in the prison. Everybody believes that Omer has died in the middle of the chaos but in reality he undergoes an extreme plastic surgery. He gets his face fixed and also changes his voice and his body so that he can take revenge. He creates a new identity and acquaints himself as Ezel (eternity in Turkish). Omer returns as Ezel (Kenan Imirzalioglu) to exact his vengeance. Meltem (Pinar Altug) and Haluk (Tamer Karadagli) have been married for 16 years and have two children: Emre (Furkan Kizilay) and Duygu (Aysecan Tatari/Hayal Garip). Although they are married for a long time, they still manage to turn the minor upsets of married life into major disasters and continually accuse each other in this respect. They squabble all the time and frequently speak of divorce but at the end, they always back down. 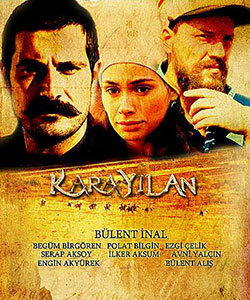 The characters of the drama is very colourful: Haluk is quite feudal and jealous, Meltem is a working wife trying to maintain her independence in the marriage, Haluk’s colleague Selami (Ozgur Ozan) does whatever his wife says so he is labeled as being a “light man”, Selami’s wife Gonul (Zeyno Gunenc) who is called by Haluk as being the “dominant aunt” is a close friend of Meltem and Haluk’s boss Ismail is a womanizer and so on. Rumeli which literally means ‘The Land of the Romans’ is the name given by Turks to the multi-cultural and multi-ethnic Balkans. The ‘Roman’ refers to in that is not the citizen of Roman Empire. It is the respectful Turkish tag given to Orthodox Christians. Farewell Rumeli (Elveda Rumeli) is a comedy/drama series that nostalgically reminisces the period that would see the collapse of the Ottoman Empire through the ordinary lives of the members of a Turkish family in Macedonia. Ramiz (Erdal Ozyagcilar), his wife Fatma (Sebnem Sonmez) and their five daughters live barely in a small village affiliated to Pursican county of Macedonia in 1896. Ramiz works as a milkman and wants nothing more than to find appropriate grooms for his precious daughters. He wants to live the rest of his life quietly and at peace with the world. However, ensuing events shows us that his modest wish would never come true. His eldest daughter Hatice (Gulcin Santircioglu) is in love with the county’s poor tailor Hasan (Tuna Orhan). Younger daughter Zarife (Filiz Ahmet) meets teacher Aleks (Ertan Saban) and wants to get married although they come from socially different backgrounds. Middle sister Vahide (Berrak Tuzunatac) comes across Doctor Mustafa (Tolgahan Sayisman) who survives from the police raid in Istanbul and makes his way to Macedonia to hide.